The “Embarcadero Academy 2012” series of Delphi-related workshops was very well accepted in Slovenia so we (Embarcadero, Slovenian distributer Marand and me) have extended it into year 2013. 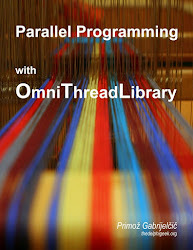 The first workshop will be – due to a popular demand – revisited extended workshop on multithreaded programming. I’ll be extending the topics covered in the first workshop with many practical examples. As always, workshop will be lead in Slovenian language. Register here!